OSWEGO, NY – In the game of Scrabble, the word literacy is worth 13 points. In real life, it’s priceless. 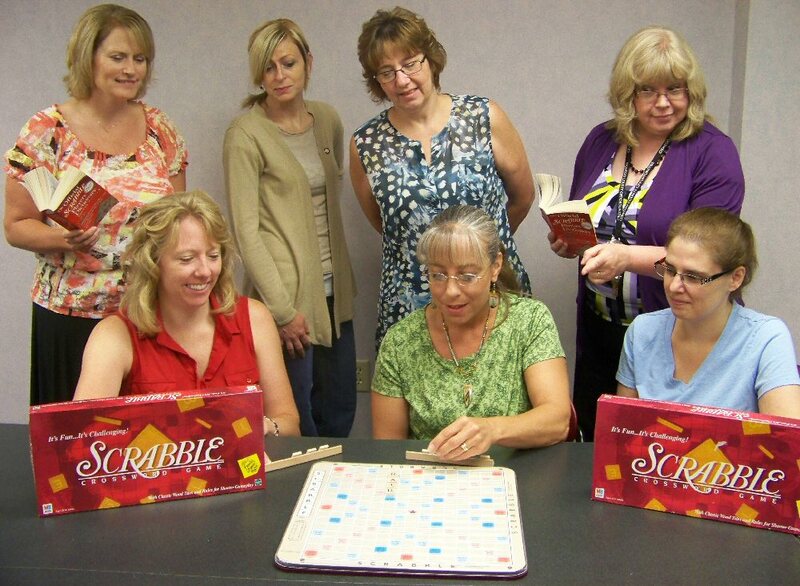 On Sept. 19, Literacy Volunteer will hold its eighth annual Diane Falise Memorial Scrabble Fest. Committee members of Scrabble Fest practice their word skills as they meet to discuss plans for this year’s event. Seated from left are: Paula Hayden, Meg Henderson and Jennifer Bragg. Standing from left are: Janice Scott, Kristen Barnes, Beth Kazel and Betsy Copps. Absent are committee members Sandy Wells, Sarah Irland and Diane Cooper-Currier. One of Oswego County’s most entertaining fundraisers, Scrabble Fest offers devotees of the game the opportunity to enjoy an evening of friendly competition and more. Scrabble Fest takes place from 6:30 to 9 p.m. at Elks Lodge, 132 W. Fifth St. Doors open at 5:30 p.m. and games will begin promptly at 6:30 p.m. Teams of four will compete against each other with the top three teams awarded prizes. New this year is the introduction of the ‘Golden Tile’ and the opportunity to earn an additional 100 points for the team score. “In honor of Literacy Volunteers celebrating its 50th anniversary this year, teams will be able to purchase a limited number of ‘Golden Tiles’ which will play as a blank tile and can be used for the letter of their choice. We will also be awarding an additional 100 points to the team who obtains the highest pledge amount,” explained Henderson. In addition to the Scrabble competition Henderson said that there will be a silent auction featuring some great items donated by local merchants who support Literacy Volunteers, and a 50/50 drawing. Entry fee for a team of 4 is $100 and includes light refreshments. The cost for individuals wishing to attend but not compete in the event is $15 (this fee includes light refreshments). All proceeds will benefit LVOC. “Whether you’re playing or just rooting on your favorite team, Scrabble Fest is a great opportunity to get your friends, family or co-workers together for an evening of fun for a very worthwhile cause that may have a tremendously positive impact on a person’s life,” Henderson said. Operating under the auspices of OCO, Literacy Volunteers provides confidential tutoring services at no cost to the student. Tutoring includes basic literacy (reading and writing), English literacy to improve English speaking, reading and writing skills, and some simple math and computer skills. Volunteers have been providing Literacy tutoring in Oswego County for 50 years.